The 2015 PBA Commissioner’s Cup Finals can end on Sunday as the Talk N Text Tropang Texters moved within a win of copping the title after defeating Rain or Shine in Game 5. 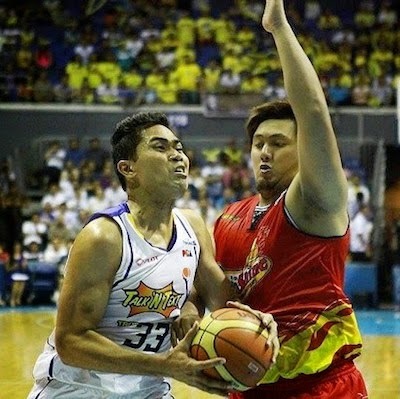 Ranidel de Ocampo had another superb showing to leas TNT to a big Game 5 victory. The Talk ‘N Text Tropang Texters moved within reach of the PBA Commissioner’s Cup title after dismantling Rain or Shine, 103-94, in a steady Game Five showing on Friday at the SMART-Araneta Coliseum. They dominated the second quarter and took leads of as high as 20 points before weathering some big shots from Rain or Shine in the endgame to take a 3-2 lead in their best-of-seven title series. Jayson Castro added 15 points and 9 assists, while Larry Fonacier added 12 points and 7 boards in the contest. Rain or Shine, behind some hot shooting from Paul Lee and Wayne Chism, who combined for 15 early points, the Elasto Painters jumped out to a 20-11 start. But it would not be long before Talk ‘N Text would turn it into a tight contest. Fonacier suddenly came alive while reserves Kevin Alas and Harvey Carey both did their share as the Tropang Texters chipped away and took the lead at 27-26. Talk ‘N Text, though, took the game over completely in the second. Fonacier and Castro both hit some three-pointers while Johnson hit on a drive to the basket as they went on a 15-3 run that gave them their first double-digit advantage of the game, 47-37. The Tropang Texters took the quarter, 29-13, and carried a 14-point lead, 56-42, into the halftime break. Rain or Shine made some headway late in the third, cutting their deficit back to 14 points after an 8-2 flurry to close the quarter. Lee led a late fourth quarter rally for Rain or Shine as they came back to within five points, but clutch baskets from Alas and Johnson sealed the win in the end. Best Import awardee Chism recorded 25 points and 17 rebounds to pace the Painters, while Lee added 19 markers. Line of the Game: Wayne Chism (ROS) - 25pts, 17rebs, 2asts, 1blk, 3 triples. Ivan Johnson unloaded a great game as TNT gained a 3-2 series lead over ROS. Wayne Chism's big numbers weren't enough to propel ROS to the crucial Game 5 win.